As most of you probably already know, we were burglerized in the early hours of Thursday morning. They smashed the front door of the store with a hammer and then shattered the reel display cash as well. They pretty much cleaned out, or damaged, every reel in the case (101 reels gone and 18 damaged) and they got 35 rods (4 others damaged) off the rack as well. The alarm company called us and we found the store in shambles when we arrived. Police did their thing and they did find blood where one of the thieves cut themselves on the show case glass, the hammer and a plastic garbage bag that had been left behind. 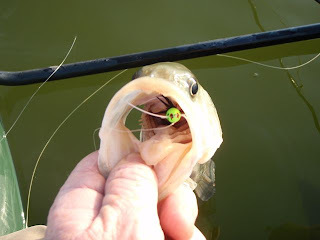 I put the word out on the flyfishing forums and we have a lot of eyes looking to see if this stuff starts showing up. Steve and I wanted to thank all of those who called, posted on the boards or emailed with offers of help and condolences we are truly part of a great community and we appreciate your kindness and support. Oh! Sorry. Nobody died or left town but we were saddened by discovering that someone had stolen two Sage rods from our demo rack. You have to understand that we have a unique relationship with our customers. Many become close friends and fishing buddies so it is painful to think that someone that we care about and trust may have stolen from us. I guess we are naive in a lot of ways but we like our customers and we always want to think the best of them. Now we have to act like business men and install a security system to monitor our store. Something we have really resisted doing. I guess times change and we must to. Maybe I'm wrong, maybe it's not someone we know after all. But, if someone you know shows up with a nice used ZAxis 904-4 or a 908-4 ZAxis (both without a case or rod bag) or someone tries to sell them to you give us a call or drop us an email. Oh! If the thief is reading this just know that you stole more than a couple of rods, friend. Here are a couple of videos from my trip to Chile last April. I'm using Imovie to edit the footage and any creative input you may have is appreciated. Enjoy! 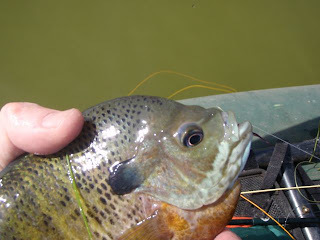 Well, I am interested in knowing whether anybody is using fiber glass fly rods anymore and what rods they are using? For the first time in 25 years, I used a fiber glass fly rod and boy, did I have a ball. Ken and I fished Hot Creek Ranch in early May and for much of the five days we fished it was pretty darn windy. But, Friday morning I figured it was just about perfect for me to give it a shot. It was still windy, but manageable. I was using a new Hardy 7 1/2' 4wt that I was dying to try and it was better then I remembered from the old days. I was having such a good time dry fly fishing and catching browns and 'bows to about 18" that morning. The rod seemed practically bent in two and I was putting major pressure on the rod with great results. Hot Creek is a terrific place to fish short glass rods. Lots of open spaces with not much worry about obstructions. I started out fishing glass back in the "Stone Age" and glass rods weren't that great until Fenwick came along. Better than that were the old Scott Power-ply glass rods and the Winston glass rods. With the introduction of graphite to cut the weight down and the rise of prices in production, glass just faded into the sunset. But fiber glass may be poised for a comeback. So with that in mind, why don't you bring out from moth balls some of those old glass rods and give them a shot again. You may be pleasantly surprised. Just a thought! I've been thinking about fishing and friends a lot lately. I know to some of you me thinking anything is a dangerous proposition, but hear me out. With our Baja trip now just a couple of weeks away obviously this has been the main focus of my daydreams. The Sea of Cortez at sunrise is as flat, glassy and beautiful any lake can be, with an equally amazing variety of fish to test you and your gear. 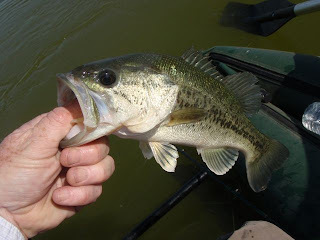 Last week it was fishing a secluded bass pond on Tejon Ranch. 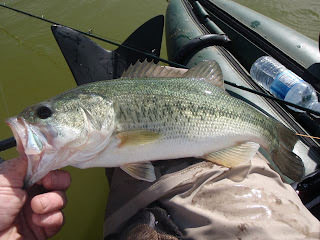 I haven't done a lot of bassing or any other warm water fishing since I moved to California and it really brought me back to my roots as a kid on the East Coast fishing for bass and pickerel with my brother. The One Fly Tournament was another great event in the past couple of weeks. On the horizon are trips to the Kern, the Eastern Sierra, Montauk in October and hopefully Christmas Island in March of next year. So as you can see I have been thinking a lot about fishing. Which brings me to friends. While there are times that it's great to be fishing in some secluded spot, alone with your thoughts, what makes this sport really special for me are the people who share it with me. I consider myself to be so fortunate to have met and fished with the people I have met since I became a full time flyfishermen. The "Spot" has only expanded my access to some really great people and some fantastic opportunities that I wouldn't otherwise have had. I was there when Dean finally caught his first Roosterfish last year. I was there when Dave won two of the three awards at the "One Fly". I watched Artin fish the surf for the first time. Last year I caught my first Rooster, first Dorado and first blitzing surf Striper in the company of some of the same guys. I always look forward to Steve and Ken's Chile reports, mink and all! There are way too many names, places and memories to list here, but I think you see where I'm going with this. The common thread here is not only the shared experience and passion for the sport but the friendship, camaraderie and love I feel for my friends. They make me happy. They make me laugh. They accept me for who I am. I only hope that I am as good a friend to them as they are to me. It has been said that "no man is a failure who has friends". Truer words were never spoken. 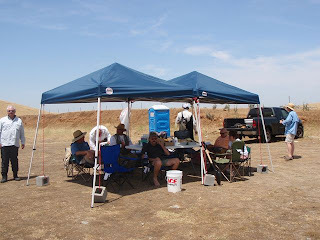 Our store sponsored trip to Tejon Ranch was a big success thanks mostly to the hard work of our buddy Russ Gabel who provided shade canopies, chairs, coolers full of beverages and a fantastic lunch delivered by his better half, Debbie. Everyone enjoyed success on LM bass and fat bluegill which were willing to slam a variety of flies from nymphs to poppers. 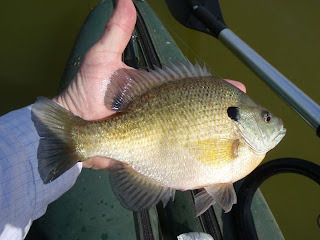 The bluegill are really fat and very strong. 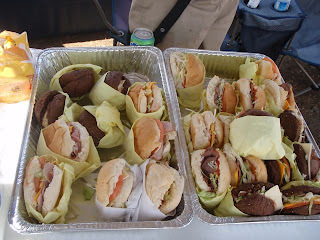 A fine selection of very tasty sandwiches delivered for lunch. No, this is not a gypsy encampment. Just a group of intrepid anglers after a fine morning on the water. 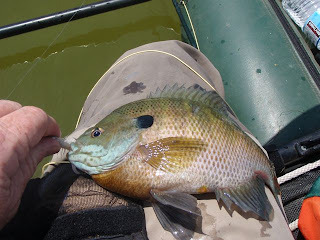 The male bluegill are impressive in their spawning regalia. The females, although not as bright, pull just as hard. 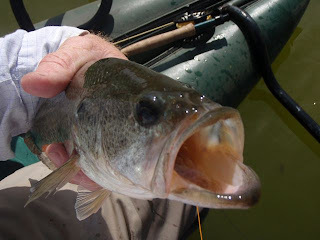 This is why they are called Largemouth Bass. in a pale version from deeper water. All in all a very satisfying day on the water. We will be doing more of these in the future. Stay tuned. Years ago I'd drag small flies around a local pond at the end of my spinning rod. This was before I could afford fly gear (I still can't afford fly gear ha ha ha). This was in the sacred city known as "Creek of the Walnuts" to the north of here in the shadow of Mount Diablo. It was in this scum-filled pond that I learned to flycast. 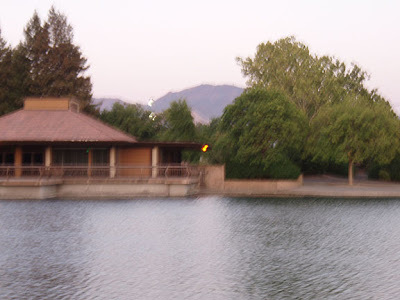 Overlooking it, at its recreation center, the Diablo Valley Fly Fishers would meet. I could walk to the meetings! I was in the area over the weekend and decided to drag a small fly as dusk set in (A Chiaki mini-bugger). 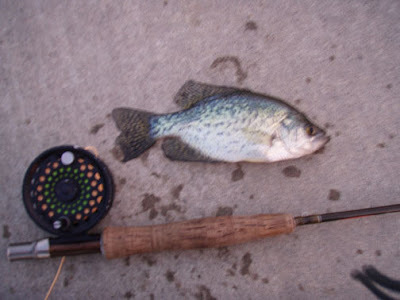 Within seconds I caught a small crappie that was 100% cookie cutter what I used to catch as a kid. It was a very strange moment. It truly was identical to the fish I caught hundreds of decades, no centuries ago! HG Wells chuckled from on high.